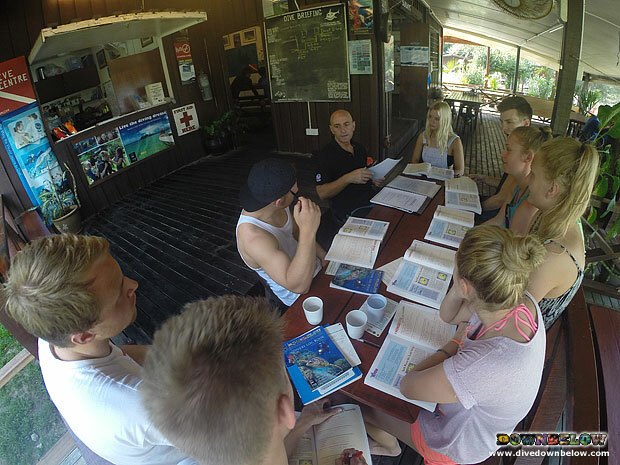 Platinum PADI Course Director Richard Swann goes through the Advanced Open Water Course knowledge reviews with some of our Danish Adventurers as they continue their diving education in sunny Sabah Borneo. This course opens up new possibilities for the divers as their diving skills are fine-tuned which allows them to explore some of diving’s top adventures. Anyone who has completed the PADI Open Water Course can enrol on this course immediately as you don’t need to have any minimum number of required dives. The advanced course covers underwater phenomena, diving procedures, the diving environment and deep diving procedures. It consists of 2 Core and 3 Electives dives. The 2 core dives are Navigation and Deep dive and the Elective dives are Fish Identification, Search & Recovery, Night, Peak Performance Buoyancy or any selected by the Instructor and participant. Choosing the location to complete this course is important too and Tunku Abdul Rahman Park which is located just in front of our PADI 5-Star IDC Dive Centre provides an ideal venue for the course, with wreck, reefs and lots of critters to explore. Have you completed the PADI Open Water and wish to learn more scuba diving skills? Send us an email today and complete the PADI Advanced Open Water with us – we’re located just 10 minutes away from the city of Kota Kinabalu!